Starting this week, The Comics Herald will be reviewing the new episodes of The Walking Dead television series. Being a fan of the series, throughout its iterations in comics, games and of course the television show, I thought it be best to bring readers up to speed with my thoughts on AMC’s zombie hit before I began reviewing the latest season. This will include spoilers of course, as will all my reviews for the series, so you have been warned. Twice. Yes. It’s a show about zombies. On cable television. I continue to be amazed that this show even exists, and pulls massive numbers in the ratings, prompting it to have the largest cable audience ever. But I digress. The creative team really have come into their own in the overall aesthetic of the show. The zombies have their own look, which is masterfully created through continually impressive prosthetic make-up, and there always manages to be a few standout individual zombies that really set the tone. From the little girl and the bicycle girl in the premiere, to the creepy Governors Daughter, the show has continued to outdo itself in creative ways to show the living dead. Spattered with a healthy dose of blood and gore of course. This is a major problem I have with other shows that decide to stick closely to the source material. Game Of Thrones did not hold my interest for purely because people who were watching it with me knew exactly what was going to happen and when. It takes the fun out of watching a show week-by-week when there are people who will know how it is going to end. The Walking Dead overcomes this problem by using the source as a basis, rather than a bible. It allows for expectations to be subverted – characters who were alive in the comics are dead, and vice-versa. It’s having the cake and eating it too, having the pure fan service of seeing these characters on screen, while at the same time being legitimately worried for them. It keeps it both familiar and fresh. In taking liberties with the source material, some of The Walking Dead’s best characters have spawned from the deviations. Norman Reedus is obviously excellent as Daryl, and this newer, more charming version of the Governor, is handled excellently by David Morrissey. Other standouts include Carol (who has enjoyed a really intriguing character arc), Hershel and of course Glen, each of which have enjoyed some of the more consistent characterizations throughout the series. As for the deceased, I was a huge fan of Shane too, especially considering he too outlived his comics counterpart. On occasion The Walking Dead gets its characters right, and when it does it’s a treat. You did notice the “on occasion” didn’t you? When The Walking Dead’s characters are firing on all cylinders, it does so excellently. When it isn’t, the engine begins to stutter and act in ways it really shouldn’t. Andrea and Lori are the main offenders here, despite the former beginning promisingly, and the latter offering a small amount of redemption in the end. I’m willing to include Dale here too, especially as towards the end he began grating on my nerves. At times it’s a small niggle, with characters making small mistakes that make me raise an eyebrow, but other times it is downright infuriating. It also doesn’t help that when a character becomes unlikeable enough (Andrea, Lori), or when the writers really don’t know what to do with them (T-Dog), they tend to be killed off. It’s the fact that there seems to be a large disconnect between these and the well written ones that often makes me scratch my head. See the entire middle section of the second season. Too often the show finds itself spinning its wheels, as characters meander about repeating the same mistakes over and over again. This could be a problem with the genre, as consistent tension and action can be too overwhelming, but the moments where characters sit around moping about the end of the world, however realistic, get old quickly. I also imagine staying in the same place for too long perpetuates this, which is a worry going into the fourth season when they remain at the prison. Hopefully this changes, and the writers manage to squeeze more life from their home. While Rick Grimes doesn’t fall under the “bad character” category, he exactly doesn’t fit under the good one either. Rick is incredibly flat, often reacting to events around him, rather than truly taking charge. I’d like to see more of the Rick we saw at the beginning of season three, where the “Ricktatorship” took point, but eventually fell apart anyway. No matter how many times the other characters tell us how important he is, we really need to see it. Take him out of the equation for a while, and show us how important he is. While we already know the producers have teased something big coming to the survivors, I’d like to see a better defined antagonist. The Governor is definitely set to return, but I felt the whole Woodbury army was underused, and considering how quickly the remaining members of that community defected to our heroes, I would love to see some good old fashioned deceit and sabotage from these new members. I know this is a show about the end of the world, but having characters regularly hitting just the one note (read: depressed) gets old quickly. 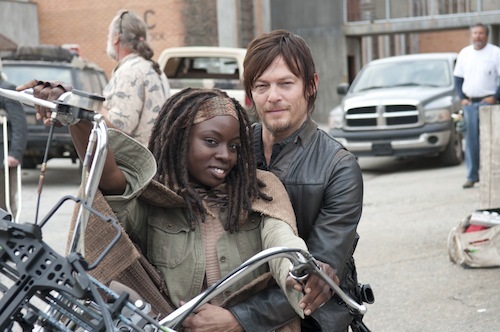 Michonne is the biggest offender here, as her brooding has gotten old quickly – crack a smile, tell a joke. They may be surrounded by zombies at every turn, but for their own sanity, and ours, just act a little lighter. The more upsetting events will have more impact if the lighter moments are just that little bit lighter. As I am writing this, the premiere has aired already, having snuck up on me without me realising, so the review will be up not long after this post has. Otherwise reviews for the episode should be up on the site the following day.